ANTOINE GRIEZMANN SAYS he is trying to bring joy to Atletico Madrid fans after drawing criticism for ‘shushing’ supporters in a match earlier this year. 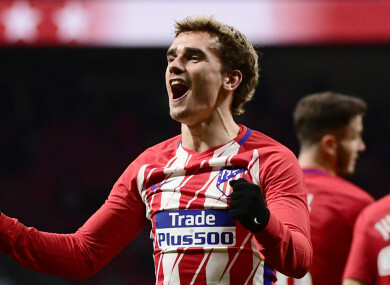 Griezmann gave a mesmerising individual display for Atletico on Wednesday, scoring all four goals in a 4-0 demolition of Leganes that saw Diego Simeone’s men move within four points of La Liga leaders Barcelona. A second hat-trick in four days after a treble against Sevilla on Sunday indicates Griezmann is one of the world’s hottest players, with his first strike against Leganes bringing up his 100th Atleti goal in all competitions. “You have to enjoy it, I’m trying to give people joy,” Griezmann told beIN SPORTS after a blistering performance saw the striker reach 15 La Liga goals for the season. Griezmann has been linked with a move to Barca at the end of the season but Simeone’s men, who travel to Camp Nou on Sunday, have piled pressure on the leaders. “I’m happy with my performance, but as I always say, the three points are the most important,” Griezmann added. “Now let’s go to Barcelona to see if we can do something beautiful. Email “Griezmann scores four to take him past century of goals for Atletico Madrid”. Feedback on “Griezmann scores four to take him past century of goals for Atletico Madrid”.